Bob Poulter at Valley View Nurseries in the 1940s using a rotary hoe with Arthur Poulter in the background. The area was in the top left corner of Huntingdale and Waverley roads, previously Mrs Donaldson's house. THE Poulter family were prominent farmers in Burwood and Ashburton for many years. Can you imagine owning nine acres of land on Boundary Road Burwood, now the corner of Warrigal Road and Ventura Street Ashwood? Purchased in 1922 for just £1550! This soon became the location of R. Poulter and Sons, Frimley Carnation Nurseries. Previously their farms were near the Holmesglen station and at the (later) site of the Waverley High School. Robert Poulter sailed to Australia in 1888 from Frimley in Kent and began to grow carnations at Canterbury on land measuring just 140 by 33 feet. They held what must be a record in Australia, having won over 1000 first prizes for carnations, and medals, cups and trophies. They also won blue ribbons for roses and the two open championship medals presented by the National Rose Society of Victoria in 1931 and 1932. Mr Poulter said “perpetual-flowering carnations are most popular in Australia.” Later he and his three sons grew camellias, vegetables and citrus trees. The lemon and orange trees were sold at plant nurseries and stores like Coles (remember when they had a garden department?). So there are Poulter’s lemon trees in the backyards of thousands of Melbourne homes. From the 1950s, citrus trees became their main plants and in that era his son Arthur Poulter moved to Clarinda to specialise in that field, where the next generation also had citrus tree nurseries. 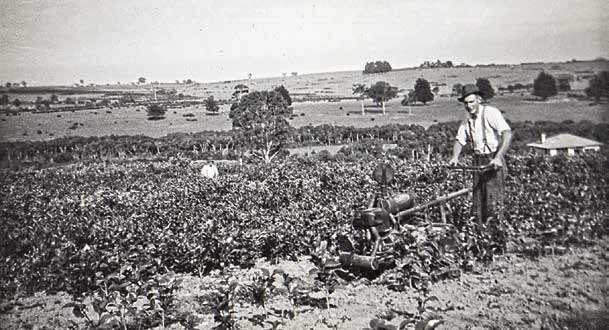 Another son, Robert (Harry) Poulter grew roses at Mount Waverley. All nurseries have closed now, with little remaining, only Poulter Street in Ashburton reminding us of this history. 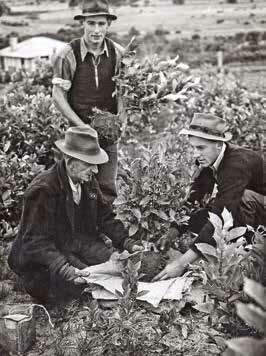 Arthur Poulter (kneeling at left), Robert Poulter (standing) and Ron Poulter.